There were two standout production bikes of 2018 at EICMA: Ducati’s Panigale V4 and the KTM 790 Duke. 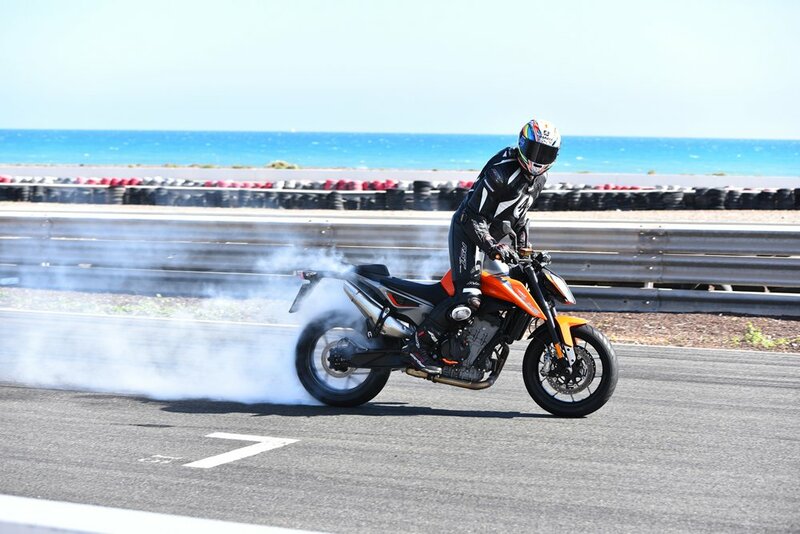 And, after Chris pulled a sicky, I hopped on the flu-ridden easyJet flight to Gran Canaria for the launch of KTM’s all-new naked middleweight contender. The 799cc LC8c parallel twin is the first all-new motor from Mattighofen since 2003. KTM engineers opted for this configuration for compactness, and it is a tangibly slender chunk of metal that packs 105bhp. Thanks to the firing intervals – 75 degrees apart – the 790 still sounds like a v-twin, but without the low-end chugga lugging and lumpiness. At the other end of the rev spectrum, forged pistons and a secondary balancer shaft in the cylinder head cope with the 10k redline. Another first for KTM is the engine being a stressed member of the chassis. WP split-function forks are non-adjustable (like the old 690) and KTM worked alongside a Spanish company to furnish the 790 with brakes. For the vertically challenged amongst us, the standard seat height is 825mm and a low seat option is 805mm. There’s also a 780mm chassis lowering kit. And then there’s the extensive electronics suite; launch control, adjustable traction control, anti-wheelie and multi-option ABS – all controlled by lean angle sensitivity – plus a quickshifter and blipper. Contrary to rumours, the ‘Track’ mode, which is rider configurable, comes as standard and allows anti-wheelie and TC to function separately. And finally, after however many years, you can cut the ignition, turn the bike on, and the system will remember your previous anti-wheelie setting. Thanks to silly laws, ABS resets itself. 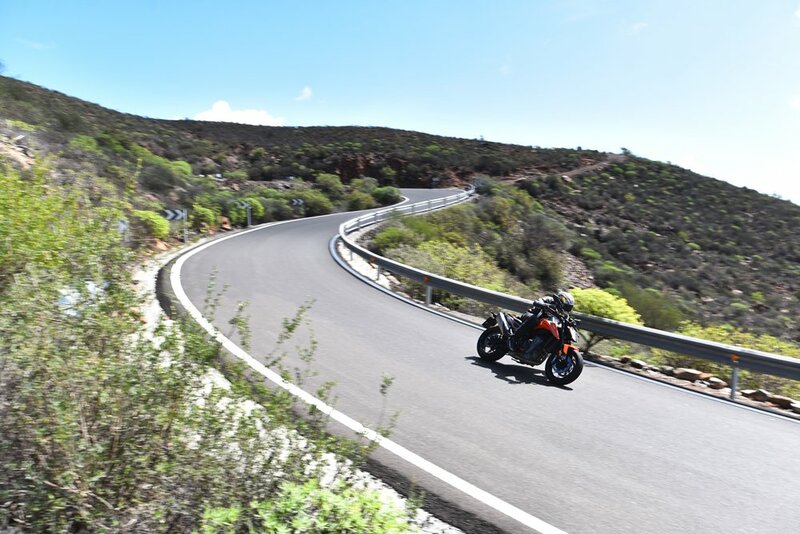 We spent the morning carving through the mountain roads of Gran Canaria on the Scalpel before heading to Maspalomas circuit to explore the 790’s limitations – and do some skids and wheelies. KTM wanted the most agile bike in the naked middleweight class and it’s safe to say they’ve succeeded. It steers with unfathomable pace, despite a very long wheelbase and it soon answered the most pertinent pre-ride question I had. Does the 790 carry those inherent Duke motard-based manners, or is it more of a midi supernaked? Well, thankfully, it’s the latter. 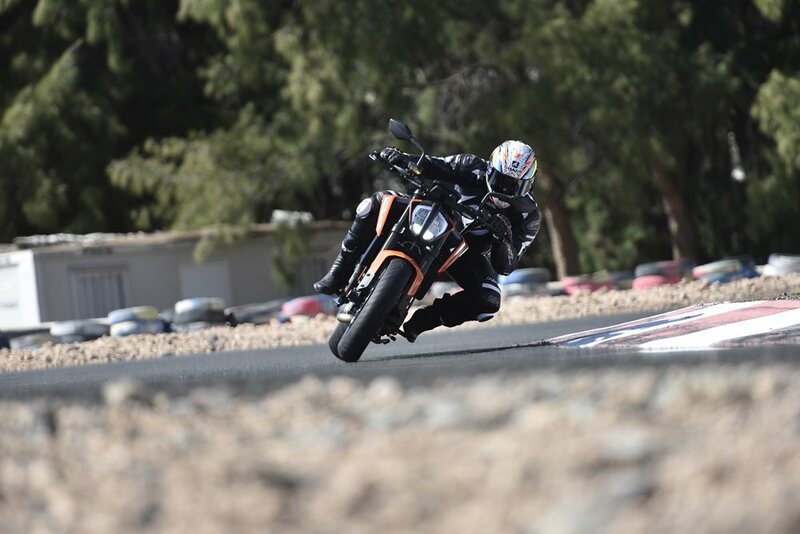 Plenty are rightly positioning the Duke against Triumph’s Street Triple and, while the 790’s horsepower deficiency over the Street Triple is all too evident, the KTM makes up for an outright power deficit by offering superior smiles-per-hour and lightning dynamics. It would have absolutely chewed the Triumph on the nadgery mountain roads thanks to enhanced agility and flickability, although I would have liked some more initial bite from the brakes. It’s not as if I was yearning for more speed anyway. There’s a sumptuous blend of power, balance and control, with the front wheel hovering the surface during hard acceleration. Packing oodles of usable grunt at the bottom, the Duke still prefers life above 7,000rpm with a palpable hit in the midrange. As mentioned previously, the throttle and low-RPM etiquette is quite smooth (for a KTM), although if you want aggressive you can have aggressive. ‘Sport’ throttle is almost 1:1 and certainly livens the delivery, but is too aggro for urban climes. ‘Street’ is just the remedy. And what about the non-adjustable suspension? We’ve seen plenty of experts who reckon it won’t suffice, but I had no issues whatsoever – until we came to spanking it on track and it all got a bit bouncy. The only other concern is the 790’s puny 14-litre tank. In summary, it’s as if the A-Team have gone into a cave armed with a 390 Duke and a 1290 Super Duke R, and forced the pair to make sweet love. The consequent offspring is the compactness and agility of the 390 combined with that innate lunacy of the 1290, just far more manageable with a far more digestible price tag of £8,499. I’m a disabled rider after losing right arm in motorcycle accident in 1999. I’m looking at this to replace my 2010 Aprilia Mana and when the 790 comes out. I’ll be all over the controls to see if it can be modified. I’d like to hear about or see the autoblipper in action across all rev rages (not just flat out), lightness of the clutch lever and if you see a KTM tech can I get or modify the throttle to work in reverse! Keep up the good work. Thanks for comprehensive “first impression”. KTM Duke 690 riders are curious about the differences. Does the 790 have a sportier, less upright riding position? I hope so! Ergos similar (690 vs 790) or quite different? Still upright but ‘bars are narrower, the pegs are much further back and the whole riding position is more compact.